The UF Law Moot Court Team advanced to nationals in the New York City Bar Association’s National Moot Court Competition. The team took second place behind Stetson Law in the regional round of the competition last weekend at UF Law in the Martin H. Levin Advocacy Center Courtroom. UF hosted a total of 14 teams from Region 5. Two of the 14 teams were from UF, including the team that placed second overall and earned a position at the national competition. UF Law Moot Court’s two teams consisted of Ray Harrell Jr. (2L), Emily Swire (2L), Brandon Butterworth (2L), and Brandt Carlson (2L). Professor Mary Adkins is the Moot Court Faculty Advisor. Harrell (2L) and Swire (2L), were coached by Andrew d’Adesky (L) and Stefan-Jose Garcia (3L). Butterworth (2L), and Carlson (2L) placed second to Stetson University, but beat out other teams, including the University of Georgia. They were coached by Alex Platt (3L). Butterworth and Carlson will go on to compete in the national competition at the New York City Bar in mid-February. 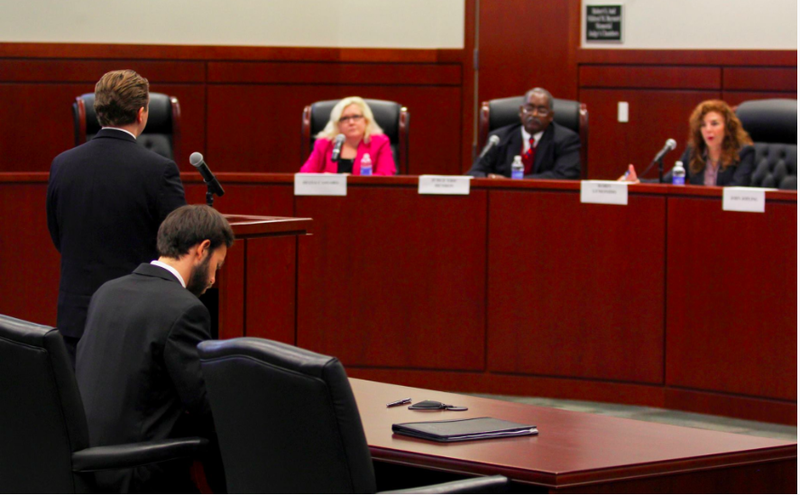 The competition gives students from around the country the opportunity to test their appellate advocacy skills. Over 150 law schools compete in the regional rounds in the U.S., and of those, only 24 teams continue to the national competition. Each of the 12 regions is given the same case facts so the teams at nationals can compete against each other and continue to hone their skills while competing against teams from across the country. The New York City Bar Association National Moot Court competition is sponsored by the New York City Bar and the American College of Trial Lawyers.